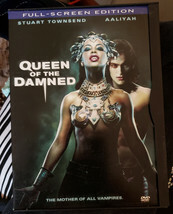 Queen of The Damned dvd Vampire movie sci fi shows full screen This is the dvd move The Queen Of the Damned. This is a horror vampire movie with som great rock music in it. It is full screen and in good condition. Follows the legendary vampire Lestat (Stuart Townsend), who has reinvented himself as a rock star in the contemporary American music scene. His music wakes Akasha (Aaliyah), the queen of all vampires, and inspires her desire to make Lestat her king. Akasha's malevolent power is so great that all the immortal vampires must stand against her if they want to survive. Meanwhile, a young London woman with a fascination for the dark side (Marguerite Moreau) falls in love with Lestat.